For a few months now, we’ve seen a resurgence of generational conflict arising from a series of articles written in defense of one generation or in celebration of another. These pieces indicate that baby boomers have lied to millennials, millennials are lazy, all generations are destined for failure. There’s amusing, certainly and perhaps thought provoking—but none of them are right. The truth of the matter is that the millennial generation is faced with a different set of problems—a generation told that college was the only option for a financial future has left them with mountains of student loan debt and a job that will barely cover the cost of rent. They’re a generation that is well spoken and well educated, but not well employed. But they’re getting there. In fact, roughly 60% have no desire to climb a corporate ladder in search of the American Dream. As many as 71% have plans to quit existing jobs and work for themselves. The “you can do anything” mentality that has been criticized by older generations is resulting in young people who are willing to take a chance and invest on themselves. If this sounds like you (or a child or a niece or a family friend), take note—it’s a long and difficult road, both mentally and financially. Fortunately, there are a number of ways to make ends meet as you prepare to be your own boss. By ditching bad habits that might be emptying your bank account and scoping out the passive income options available to you, you’ll be able to pursue your entrepreneurial dreams while paying your bill in time—and maintaining your all-important credit score. As crowdfunding gains popularity, so does the idea of social lending networks. Such sites (Like Lending Club) provide a platform where the individual is the bank doing the lending. This means that you offer your current money to individuals in approximately $25 increments and charge interest. Some are high risk investments, but others offer a low risk way to make a little bit of extra money with little to no effort. If you’re already a home owner or in a position to become one, this might be a great option for you. Real estate investment and management is an especially good opportunity if you’ve got a bit of time on your hands. Most landlords make around $500 profit each month, which can really add up. If you’ve got the property and home, but not the time, there are companies that will manage your real estate for you. For a fee, they’ll take care of maintenance, etc.—leaving you to collect a bit of extra cash. Of course, the easiest way to earn extra money is to simply earn it by performing a job. This is easier said than done, especially if you’ve got a traditional nine to five job. Luckily, there are a few jobs that a person with a college education and a persistent attitude can grab to increase their income. Many people find plasma donation an easy way to make approximately $200 per month. Though it is considered a donation, plasma donation centers pay you for your time (about an hour each time you visit, excluding the first). Typically, the first donation of the week pays around $20, while the second offers $30. You can donate up to two times every week, assuming there is a day in between. You might also consider getting some extra work as a freelance blogger. Many sites hire independently contracted people to write for them. Assuming you are able to make deadline, these types of jobs are great because you can perform them at any time from a variety of places. You should expect to make around $10 per entry. Working for yourself will be no easy task, but millennials will find company in the experience of one another. Whether you’re a budding entrepreneur or a parent to one, let’s celebrate the diverse business experience each generation has to offer! Getting laid off can be a shock for anyone. Sometimes they come as a surprise and on some occasions layoffs are expected. When you’re presented with a layoff, you may feel that your life is crumbling before your eyes. With no job and debt, how will you pay your bills? The thought of having no job and debt can keep even the most financially stable person up at night. It’s every ones worst nightmare. So if you’re not going into unemployment with a large amount of savings then how do you handle debt while laid off? 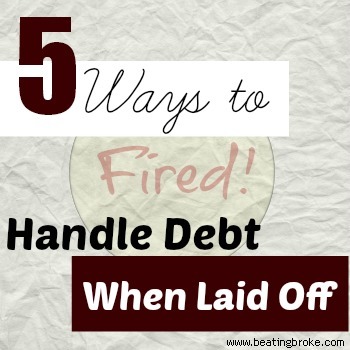 There’s no simple answer to this question and every situation is unique but here are five tips to help you handle debt when laid off from your job. Make a list of all of the monetary assets that you have. You should know exactly the amount of money you have in your checking and savings account. As for credit cards, know your available credit. If you have any investments or retirement accounts, you should know the cash value for those as well. Desperate times call for desperate measures and you will probably need these funds in order to get by. You always want to pay secured debt first. Secured debt means that the asset can be claimed by the lender if the borrower falls short of payments. Examples of secured debt are your house and car. Your mortgage, utilities and food expenses should be the first expenses that you pay before anything else. It may get frustrating getting creditor calls from your credit card companies but credit bills are the last thing that you pay in these kind of situation. So don’t be pressured to pay the bill unless you can afford it. Also, don’t allow creditors to harass you. Know your rights and find out what laws in your area protect you from creditor harassment. When laid off ask your employer about a severance package. Severance package are pay and benefits given to an employee when they have been laid off. The amount given is based on the length of employment. It can include a payment for unused sick and vacation days. Severance pay should be rationed towards your bills until you find new employment. Call each creditor and make them aware of your situation. Let them know that you have been laid off. Most credit card companies will be willing to work with you due to the simple fact that they want their money. In most cases there is a good chance that you will be able to negotiate a payment plan. Also, ask your bank about a hardship plan or forbearance program. These programs can involve lowering minimum payment, temporarily lowering the interest rate, or the cancellation of late fees and penalties. It’s important to get a job as soon as possible. When you’ve been laid off and you have debt, you are not in a position to be choosy about where you work. It’s important to get a job, any job. Of course you would like to do something related to your experience and your training but you must face the fact that you may not got the job you desire. Finding a job takes time and patience, so if you know of any places that are hiring immediately, just take it. If you can’t find a job, then get creative and find ways to make money. Sale your car or rent out a room in your house. If you have a skill start contracting out work as a way to supplement income. Start a business from home using resources that you already have. In conclusion, unemployment doesn’t have to ruin your finances. Although, being laid off from a job can be one of the hardest times of your life, good money management skills and determination can help you manage your debt effectively.